These Halloween recipes for kids are delightfuly ghoulish and delectably tasty. All of these recipes would make good treats for a Halloween party (either at home or at school) and many of these recipes are simple enough for the kids to make all by themselves. The dirt dessert is especially simple and makes a good cooking activity for very young kids any time of the year. Halloween recipes for kids don't get much more fun than this one. With chocolate pudding, Cool Whip, crushed Oreos and gummy worms, this dirt is far tastier than it sounds. 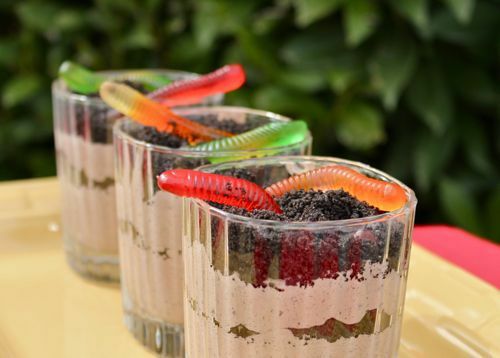 Young kids, especially, will enjoy making this dirt dessert recipe. These Halloween Rice Krispie treats will make a big impression at your Halloween party. And kids love making these Halloween treats. This is one of those Halloween recipes for kids that's as fun to make as it is to eat. Be sure to use regular (not low fat) crescent dough for these mummy dogs. It's easier to wrap around the hot dogs. Halloween recipes for kids should be fun to make, and these Halloween monster face pizzas are. With English muffins as the crust, this Halloween pizza recipe is a cinch to prepare. Gross Halloween recipes like this one are a favorite with kids of all ages. Kids will delight in how disgusting this brain Jello mold looks. But once they taste it, they'll want more. I call this Halloween punch "vampire blood" just to delight and scare the little ghosts and goblins at my kids' Halloween party. Serving this Halloween punch in glasses rimmed with colored sugar doesn't hurt either.